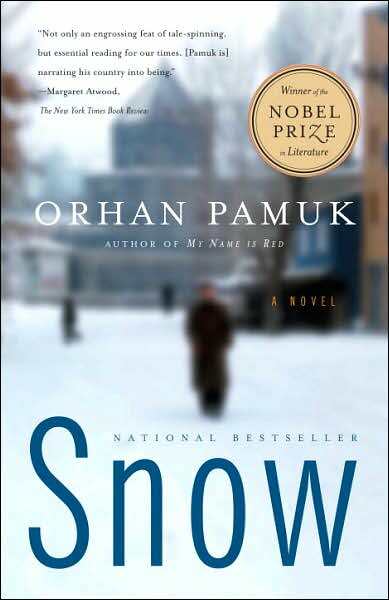 An edited version of this article was first published as Book Review: Snow by Orhan Pamuk on Blogcritics.org. This is the second time I am have picked up a novel by Turkish writer Orhan Pamuk. The first time was when I read My Name is Red two years ago. That time, I enjoyed the book, but not as much as I wanted, mainly because the book was quite complicated and hard to read. I still get the complicated part in this current book, but I think this current book is more accessible to the average reader. But before I give my critique, let me provide a synopsis first. This is the story of Ka, a Turkish poet, who has been living in Frankfurt, but decides to visit the border town of Kars. Kars is his hometown, but he hasn't been there for a while. And the official reason why he visits is because he wants to know more about the suicide epidemic that is happening among several girls in the community. Turkey being a secular state, the head scarf is highly discouraged, but there are several girls who would rather kill themselves than bare their heads. The unofficial reason is that he wanted to see a woman, Ipek. Ipek happens to be divorced, but is quite pretty, perhaps the prettiest girl that Ka has laid eyes on. Ka immediately falls in love, and during the course of the novel, tries to woo Ipek into coming back to Frankfurt with him and having a happy life. Ipek also becomes the inspiration of several of Ka's poems that he has written while in the city. But perhaps a bigger issue in the novel is the opposition between the Islamists and the Secularists. Kars seems to have a very effective intelligence agency, and Ka becomes a target of their undercover police efforts. Ka, being from the outside, is also contacted by people from both sides: the Islamists contact him, wanting to push their agenda on him, hoping that he would print something in the newspaper so that the outside world would know about it. The secularists on the other hand want him too because he has had contact with the Islamists, who they want to crush. In the end, Ka becomes a double agent, serving both sides and passing messages back and forth. More than anything, this is a political novel. It tackles the sensitive issue of Islam and secular Turkey, as there are several opposing camps that battle on the issue of religion and government. There are the religious school boys, who from the eyes of the West, are treated as fanatics who are willing to die for their religion. There are also the people who are against these Western-influenced secularists, such as Ka, who through broken logic, tries to argue that atheism is wrong and therefore Islamism is the way to go. You see several characters that are quite unpredictable, because radicalism and fanaticism are only separated by a very thin line. Unlike My Name is Red, I found this novel to be more accessible. The former book was quite hard to follow, as every chapter had a different narrator. However, I have to say that this is still a post-modern novel, and would demand your full mental ability to understand it. As much as it is a political thriller, it is not a page turner. This is not your average airport novel. Come to think of it, there are elements of non-linear narration as well. In the middle of the book, the narration suddenly fast-forwards to four years after, and we realize that the original omniscient narrator is a journalist with the name of Orhan (which is rather conveniently similar to the name of the author), and we learn that Ka is dead, and Orhan is following his footsteps. Thus, the first half seemed a simple omniscient narration, which turns into a flashback at mid-point. So, did I like this book? I cannot say that I hated it. But I cannot say that I am enthusiastic about it either. I guess I liked it because I learned some new facts about Turkish culture and society, but aside from that, it wasn't too gripping, and the topic didn't excite me as much as other novels do. I think I am giving this 3 out of 5 stars.